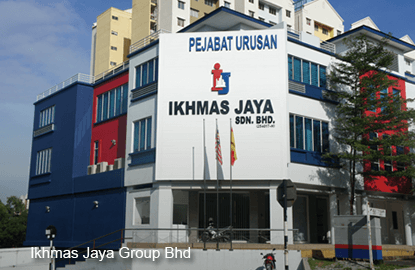 KUALA LUMPUR (June 30): Bore piling and bridging specialist Ikhmas Jaya Group Bhd, which is expected to list on the Main Market of Bursa Malaysia on July 27, expects a double-digit growth in its revenue for this year. Speaking to reporters after the launch the prospectus, Ikhmas Jaya's chief financial officer Lum Yuet Ngoh said the growth would be supported by the existing orderbook and the projects that the company is expected to clinch by end of the year. Ikhmas Jaya's group managing director Datuk Ang Cheng Siong said the current orderbook is at RM346 million and the group will be tendering RM4 billion to RM5 billion worth of projects by end of this year. He said the company is tendering elevated highway projects, such as Damansara-Shah Alam Elevated Expressway (DASH), Duke highway, the extension of KLIA expressway; River of Life project and affordable homes project. The group launched its prospectus today, pursuant to its public issue of 182 million shares of 25 sen each in Ikhmas Jaya on the Main Market of Bursa Malaysia. The issue price of the listing is at 57 sen per share. Ang also said Ikhmas Jaya plans to invest about RM36.82 milion of the RM72 million raised proceeds, to purchase construction equipment, machinery and equipment for manufacturing of prefabricated building system. The rest of the proceeds will be used for repayment of bank borrowings, working capital and listing expenses.